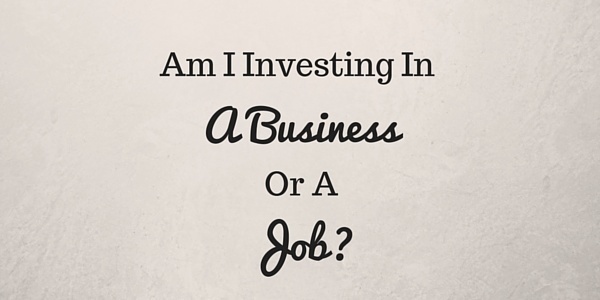 Am I Investing in a Business or a Job? Have you ever heard of the cash flow quadrant? Robert Kiyosaki developed this quadrant many years ago, and I firmly believe that before anyone chooses their life’s career path, they should be taught this quadrant. 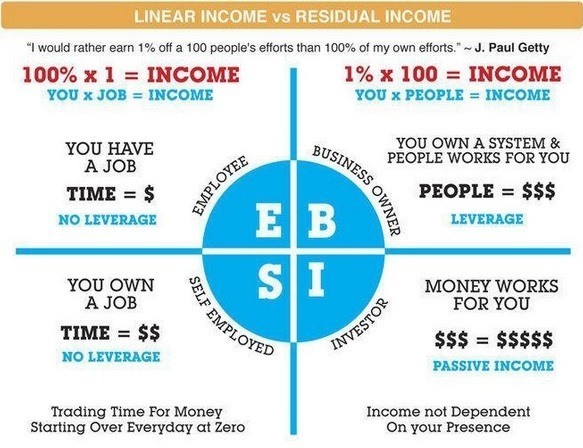 On the left side of the quadrant are 95% of the income earners in this world. These workers are commonly known because likely every single one of us falls on this side of the quadrant. We are typically either employees or self-employed. 1) Employees – This is the most common way to earn income. Many of us head off to work Monday thru Friday, from 8am to 5pm (or later) and we know exactly what our paycheck amount will be each week. We trade time for money and find a sense of security in this, but very little money is made in this quadrant. 2) Self-employed – Some people get fed up with being an employee. They feel tied down and constricted, or they feel that they’re not being paid what they’re worth. For whatever reason, they branch out on their own and become self-employed. It’s a freeing feeling, but there’s just one problem – you’re still trading time for dollars. You might earn more per hour, but if you don’t do any work that day, how much will you get paid? Nothing. On the right side of the quadrant is where very few of us are found and it’s where almost all the money is made. Of all the people in the world, 5% of the population are either business owners or investors and they earn 95% of the income. 3) Business Owners – These owners aren’t just self-employed people that work hard and earn a high income. Instead, these individuals have developed a system that replaces themselves and enables them to branch our and do more. In other words, they develop a passive income again and again, building their wealth larger and larger with very few headaches to speak of. As the phrase at the top of the graphic eludes to, these people aspire to earn money from other people’s efforts rather than their own. 4) Investors – These individuals have enough money to simply invest it and earn a living. 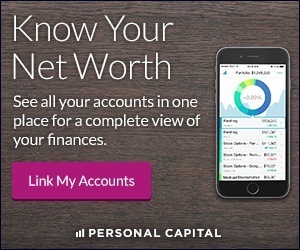 They might be angel investors for entrepreneurs, they may buy large shares of companies, or they might even invest in simple accounts since their earnings are still far more than they need to live on. Very few people land in this category, but the ones that do earn the majority of this nation’s income. So what does this mean for you? Which quadrant would you like to find yourself in? That’s kind of a no-brainer isn’t it? Of course all of us would either like to be in the upper-right or lower-right quadrant, but it’s not always that simple. For each business venture we review, we must look into the future to understand where we’re likely to land when it comes to these quadrants. Liz and I have worked very hard to get rid of our debts (even our mortgage) and to save money for future investments. Instead of depending solely on the stock market for our retirement, Liz and I would like to put our money into a business that will yield us another income besides our jobs. Lately, we have looked into rental properties, but we’re having a hard time finding a bargain and can’t seem to pull the trigger on anything. Just last week though, another opportunity presented itself. 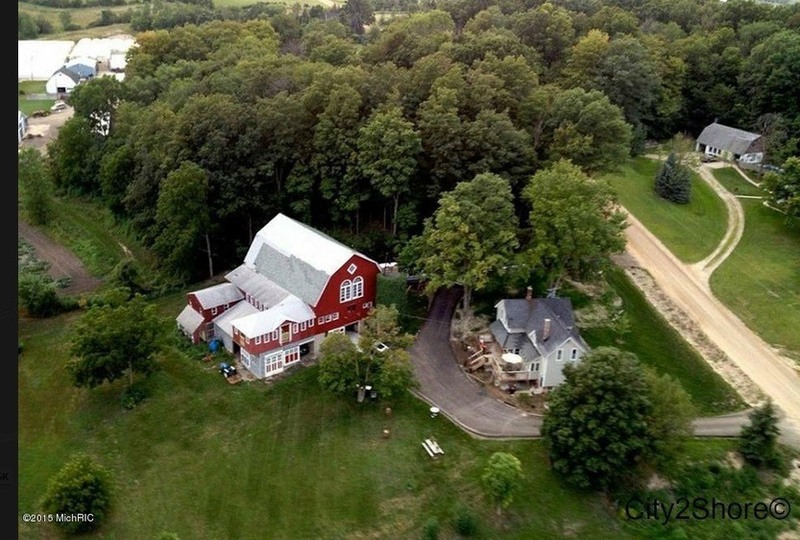 Approximately 30 minutes from our house, a farm property recently went up for sale. Only, this isn’t a regular farm. A few years ago, the family updated the grounds and turned the barn into an event center, mainly for wedding receptions. This is basically the type of venue that Liz and I used for our wedding and reception and we’ve had conversations about possibly starting a business along the same lines. Well, just two months after the wedding an opportunity is presenting itself. The property is currently for sale for $300,000, which is no small number for just 4 acres in this part of town. The main draw though is the barn and the potential revenue stream. In 2016, they already have 18 events booked at $3,000 a piece, which equates to $54,000. This sounds all well and good, but is this a business? Or is it simply a self-employed job? Well, it all depends. If we would decide to go for it, we’d likely sell our home, move into the house on the property, and start diving into the marketing, planning, and the hands-on work that would be necessary to keep the business going. After year one, we might clear $30,000 after taxes. So, would this be self-employed income? Most certainly. If we decided to live on the property and do all the work ourselves, then the only way to earn money would be to work and do everything necessary to create a successful event. Without doing the work, we would earn no money (and have many unsatisfied customers). With $2,500 per event and 18 events booked, this would equate to $45,000, or roughly $25,000 after taxes. This is the ‘B’ type business model that we would aspire to achieve. Things might not run perfectly at first, but with the proper system in place for each event, we could earn $25,000 per year and have very little involvement, which would then allow us to invest in the next business…and then the next one…and the next one – leading us to the path of the “Investor” quadrant where our pot of money becomes big enough to earn new money all on its own. This sounds like a much better option, doesn’t it? Before diving into a new business venture, be sure to analyze how much you’ll be earning in the long-term and how much of your own time you’ll need to invest. Have you thought about starting your own business? Is it a job or is it a true business?